The law offices of Robertson & Robertson, P.A. is a practice limited to representing clients in personal injury and wrongful death cases. 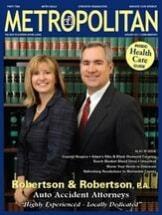 Mr. Robertson has handled auto accident cases since he was admitted to practice law in 1993. He spent several years representing insurance companies and negligent drivers in the defense of personal injury court cases. He now draws on this considerable experience, which give him great insight into the processes used by insurance companies in the evaluation and settlement of injury claims. Please feel free to see Mr. Robertson’s full biography here. Dealing with the many issues arising out of an injury accident can be stressful and confusing. Most clients express a great sense of relief after the initial consultation with our office. Mr. Robertson and his professional staff pride themselves on great communication, straight forward answers, and diligent advocacy. We provide a friendly atmosphere with a focus on the personal needs of each client. We want our clients to focus on their medical recovery while we deal with the multiple insurance issues and extensive paperwork that arise in auto accident cases. We believe that we are able to achieve the best possible results for our clients by meticulously preparing and presenting each insurance claim, avoiding mistakes, and by knowing both the legal and practical rules of handling personal injury cases. By preparing each client’s file with the same degree of diligence that we would take if we were preparing for trial, we can usually achieve a favorable settlement for our clients without the necessity of a court action. We stand ready to file suit on behalf of our clients, however, if circumstances so dictate – and the insurance companies know it. In all cases, legal services are on a contingent fee basis. This simply means that there is no charge for legal services unless we are successful in obtaining a monetary recovery for our client. When a case is resolved, whether by settlement or by court verdict, the firm is paid a percentage of the gross recovery amount. There is no charge for an initial consultation with Mr. Robertson. Please take a few moments to explore the other pages on this website to learn about The Law Offices of Robertson & Robertson, P.A. and the ways we can help people who have been victimized by personal injury or wrongful death.